A coast and ocean grabbing project that will take away the livelihood of fishworkers, farmers and others near the coasts. Massive industrialization, ecological destruction. Sagarmala is a set of projects for building the coast of India at the cost of the people's needs and in the name of economic development. Sagarmala is a strategic initiative of the Government of India launched in 2015 to modernize India's Ports so that ports and coastlines can be developed to contribute in India's economic growth. It looks towards "transforming the existing Ports into modern world class Ports and integrate the development of the Ports, the Industrial clusters and hinterlands systems through road, rail, inland and coastal waterways resulting in Ports becoming the drivers of economic activity in coastal areas". For Andhra Pradesh in March 2017, funds have been sanctioned for 13 rail and 20 road connectivity enhancement projects and two Coastal Economic Zones under the Sagarmala Programme. (1). The projects will be implemented by relevant Central Ministries, State Governments, Ports and other agencies primarily through the private or Private Public Partnership (PPP) mode, according to Minister of State for Shipping, Pon Radhakrishnan said in a written reply to a question in the Lok Sabha (parliament) on 9 Mar 2017. The projects are: Port connectivity to National Highway – 5 (Phase II), cost Rs.20 Crore sanctioned and released. Construction of grade separator from H-7 area to port connectivity road by passing Convent Junction, Vizag Port, cost Rs.29.96 Crore sanctioned and Rs.14.98 Crore released. Further, nine coastal jetty project proposals from the state are being considered for financial assistance under the Coastal Berth Scheme of Government of India. Financial assistance under Coastal Berth Scheme would be up to 50% of the total cost of the project subject to: (i) a maximum of Rs.25 Crore for projects related to construction/upgradation of coastal berths; (ii) a maximum of Rs.10 Crore for construction of platforms/jetties for hovercrafts & seaplanes by Ports/State Governments & passenger jetties in National Waterways & Islands by the State Governments; (iii) a maximum of Rs.15 Crore for mechanisation of berths by Major Ports/Non-Major Ports; (iv) a maximum of Rs.50 Crore for Capital Dredging of operational Non-Major Ports; and (v) a maximum of Rs.50 Crore for construction of breakwater for existing and Greenfield Ports. In Andhra Padesh this flagship programme to promote port-led ‘development’ aims at reducing export-import and domestic trade costs and expanding the volumes. The programme estimated about 35,000 crores (1 crore = ten million) of savings annually through cost reductions and again arbitrary data regarding job creation of 1 crore new jobs of which 400,000 have been promised as a direct employment. But for whom?, at what cost? Does economic cost of building up ports and other infrastructure account for the inevitable devastation of livelihood of Fishworkers and snatching of socio-political rights along with culture? For the whole of India with a coastline of about 7,500 Kms covering 13 states and Union Territories, Sagarmala will initiate over 173 projects initially and initiatives in four broad areas. 5 to 6 new ports have been proposed to be built. Additionally over 40 port capacity enhancement projects will be taken up. Besides increasing capacity, these projects will result in a more modern port infrastructure through the mechanization of berths and deepening of drafts to accommodate large vessels. The second focus area is port connectivity, where over 80 projects are being planned. These include connectivity infrastructure projects like a heavy haul rail corridor to evacuate large volumes of coal in Odisha, freight friendly expressways to enable efficient movement of containers on key routes, and the development of strategic inland waterways. The third set of projects is under category of port-led industrialization to boost industrial and export growth along the coastline. This will be done through 14 coastal economic zones (CEZs) along the coastline, each of which will house a number of industrial clusters. Last fourth set of projects will focus on coastal communities through skill development programme to get them in support of port-led industrialization. Project Details The Andhra Pradesh Government is drawing up plans to make the most of Sagarmala project, identifying 90 projects entailing investment of Rs. 1,30,762 crores. (2) Chief Minister N. Chandrababu Naidu has constituted a 33-member committee to monitor the implementation of these projects. Visakhapatnam Port Trust will be the nodal agency for the implementation of inland waterways projects. Two industrial corridors and five SEZs will be part of the project. The SEZs, Coastal Economic Zones, are a special focus in Andhra Pradesh. 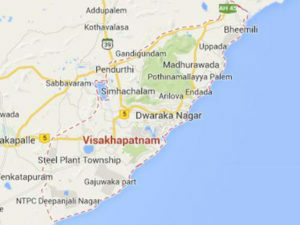 The state has 1 major port: Vishakhapatnam with ~14 other minor ports. VCIC North and VCIC Central are identified as CEZs which again comprises of many SEZs and industrial complexes. The CEZs has also engulfed the agrarian districts like Srikakulum and Vizianagaram and put to the task of port led industrial development. They even went ahead with shifting fishing harbors and developing new one which clearly shows their intention of privatization or consolidating small fish harbor into big one and hand that over to corporate and industries. Construction of tourism passenger jetty at different locations are planned which doesn’t support the traditional livelihood of Fishworkers living in the areas. VCIC Central CEZ Districts influence Chitoor and Nellore [10% of state population]. This CEZ overlaps two industrial node coming up under two industrial corridors - Srikalahasti-Yerpedu node of Vishakhapatnam Chennai Industrial Corridor and Krishnapatnam node in Nellore district of Chennai Bengaluru industrial corridor. The VCIC central CEZ comprises of 5 operational manufacturing based SEZs in the region earmarked for footwear, textile and apparel, leather sector, and multi products. Additionally there are around 20 industrial complexes developed by APIIC. The VCIC Central CEZ will come up in phased manner where in phase 1, Krishnapatnam will be the target district and in phase 2, Chitoor and Nellore will be targeted. With coming coastal economic zones, the eviction of people from the coastal area will increase in the name of either conservation, tourism or industrialization depriving the communities from the access to the coast for their basic fundamental right of life and livelihood. Why? Explain briefly. There is oppsition but it appears to be weak. Should the Sagarmala project be scrapped?